No Place Like It: A new mom makes a case for moving back home. My grandmother, lovingly known by her grandchildren and almost everyone else in her final years as simply “Atoo,” died at Christmas. My husband and I had driven through the night with our 6-month-old son, hoping to make it to my hometown before she passed. My mother, Atoo’s caretaker for the past 10 years, thought Atoo was waiting for us to get there. She had been drifting in and out of consciousness for days and had wanted to meet our son, her newest great-grandchild. A few days earlier, in a moment of clarity she had said: “I don’t want to die. I’ll miss seeing all these beautiful babies.” Atoo loved being a grandmother. When we walked into her hospital room weary from 20 hours in the car, her face was drawn, her mouth agape; she was unconscious and fighting for every ragged breath but surrounded by people who loved her. I was shocked by her altered appearance and assumed the sights and sounds of imminent death would frighten my child. But my son, so new to the world and full of love, did not know to be afraid and happily laid his head on her chest. He touched her face and hugged her neck. Later that night with my aunt by her side telling her, “It’s okay Mother, you can go now,” Atoo died. Three days later my husband and I saw a building in my hometown where we could have our handmade furniture studio on the first floor and live on the second. Despite the fact that our clients are mostly on the coasts, and our life and friends are in the Midwest, we purchased the building and began making plans to uproot our lives and move closer to a permanent community. We had not really been looking to move before my grandmother’s passing. For the past 10 years I had lived away from home and more or less liked it that way. I saw my family in a couple of intense bursts each year. Those visits were often stressful, as we traveled long distances and attempted to catch up with lots of people in a whirlwind of nonstop activity. We would arrive back in the Midwest exhausted and happy to be home. And yet after my son was born, I saw how content he was in a room full of people, who despite having just met him, already loved him. I longed for him to grow up with his grandparents close by, the way I had grown up with my Atoo. Moving closer to one’s extended family is not something to celebrate among upwardly mobile Americans. Few will think better of you because you live closer to your parents. In fact, some will think you are unwell. Most homes in the United States are zoned as single-family units, and even living across town from one another is often parodied in popular culture as a form of torture. American politicians often speak of “family values.” What they usually mean by family is one or two parents raising one or two children. They do not mean a large group of people who are descendents of a common ancestor or other types of intentional communities, which lend support to nuclear families. There is no big “family values” push to reinstate the role of elders or wisdom figures in children’s lives, though many were pleasantly surprised and intrigued when the Obamas moved into the White House with their children’s grandmother in tow. In contrast to a spouse or friends, people do not choose their family, and they do not choose you. These nonelective relationships among diverse people can be difficult to navigate. Yet family members regularly go to great lengths to help each other, as my family did—despite the 1,200 miles between us—when my newborn was sick. That experience was life-changing. Inspired by their support, this summer I am moving my little nuclear family to a city where my son will be able to be loved by not one but two sets of grandparents. The way I see it, the more good people who love your child, the better. More is more in the love department. The love of a parent is total and all-encompassing, but it can also be complicated and demanding. Parents have the difficult task of equipping their children with the skills they will need as adults, and perhaps this is as it must be. You have to answer to those you live with daily in a household: Is your plan realistic? Why haven’t you done your chores? 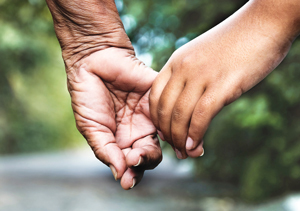 If the love of a parent is all-encompassing and at the same time demanding, the love of a grandparent can be simply enfolding. My Atoo did not have to raise me. She never asked me what my major was going to be or how I was going to make a living. She just loved me. When I repeatedly lost my house key in middle school, she would drive over and unlock the front door. It was not her primary responsibility to discipline me or make sure I was not developing bad habits. At her house we were allowed little indulgences like watching cartoons or eating homemade éclairs, things that would not be ideal as daily fare but were fun and harmless in small doses. The same is now true for my son. After trying to rock him to sleep I will often put him in his crib and let him cry for a few minutes before he falls asleep on his own. I know he must learn to deal with some frustration, to soothe himself, and he does—but not at his Grandma Ceci’s house. She will rock him for as long as it takes. A beautiful story of the value of unconditional love that only a grandparent can give. However, a grandparent has wisdom to share that should also be part of their portfolio. Recognizing that the parents have the primary privilege of raising their child, the grandparent can, and I believe should, contribute to the learning experiences wherein the child develops into an adult. It does take a village! This article also appeared in print, under the headline "No Place Like It," in the July 30, 2012 issue. Anna Nussbaum Keating writes and co-owns Keating Woodworks in Colorado Springs, Co.